PLO Secretary-General dismisses Liberman's claims that Israel has been holding secret talks with the PA, calls him a liar. 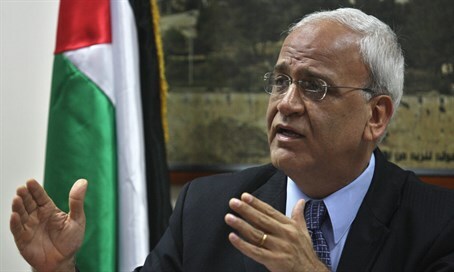 Saeb Erekat, Secretary-General of the Palestine Liberation Organization (PLO) and former chief negotiator with Israel, denied on Thursday the remarks by Yisrael Beytenu chairman Avigdor Liberman, who claimed that Prime Minister Binyamin Netanyahu has been holding covert negotiations with Palestinian Authority (PA) chairman Mahmoud Abbas. “These things are not true. This is yet another lie in addition to Liberman’s previous lies,” said Erekat. In his remarks, Liberman told Yedioth Ahronoth, "There are several strange signs on the ground that I interpret as an attempt by the Prime Minister to exclude the Cabinet from a diplomatic negotiation with Abbas." "Suddenly two weeks ago we saw that the Prime Minister is ready to free up his whole schedule for a meeting with Abbas. We see how in a miraculous manner all the argument between the Israel Electric Corporation and the Palestinian Authority on the debts was solved, and suddenly all the power cuts disappeared," he added. Erekat’s denial of the claims comes as the PA is facing sharp criticism by the Hamas-led Palestinian opposition, which accuses it of collaborating with Israeli security contrary to Palestinian interests. Most of the criticism is a result of comments Abbas made in an interview to Channel 2 recently, in which he promised to continue the security cooperation with Israel, and made statements against the wave of Arab terror attacks.